If you purchase Fire Team Fit's weightlifting belt and it does not fit, we'll give you a refund or a different size weight belt. Please do take a look in the pictures at the waist measurement chart to ensure proper weight belt size. We are so confident in the quality of our products, that if for any reason you are not satisfied with your Weightlifting belt, we will give you a full refund. Exercise in the Gym - Fire Team Fit Weight Belts help promote good form while lifting. Avoid injury and maximize your exercise performance. Available in Black, Blue, Grey, Pink and Camo. Work Out with Confidence - Feel and look your best while promoting safe weight lifting technique. Lightweight Contour Design - This belt is designed to support your back while providing you the mobility to perform multiple exercises. Not only can you Bodybuild using the weightlifting belt, but it is ideal for exercises such as Back Squats, Power Cleans, Dead Lifts, Clean and Jerks, Overhead Squats and much more. 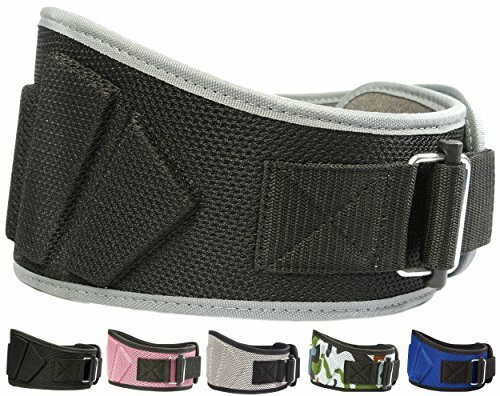 Abdominal and Lower Back Support - Unlike a leather belt with a predetermined set of holes, the velcro support strap gives the ability to adjust tightness for the desired comfort and support needed for leg and core body exercises. Use for Powerlifting and Olympic lifting - The Weight belt provides great support for a variety of exercises. View More In Weight Belts. If you have any questions about this product by Fire Team Fit, contact us by completing and submitting the form below. If you are looking for a specif part number, please include it with your message.